Heat a pan, add the grated coconut and jaggery. Stir for about five minutes. Add the nutmeg and saffron, mix well. Cook for another five minutes and keep aside. In a deep dish, boil water with ghee. Add the salt and flour. Mix well. Cover the dish and cook till its half done. Spread some ghee on the base of a steel bowl and while the dough is still hot, knead it well. Now take a little dough, roll it into a ball, flatten it well, shape the edges into a flower pattern. Put a spoonful of the filling onto the dough and seal it. 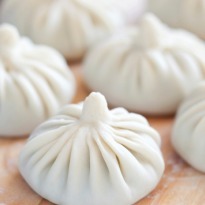 Put the dumplings in a muslin cloth and steam them for 10- 15 minutes. Serve.